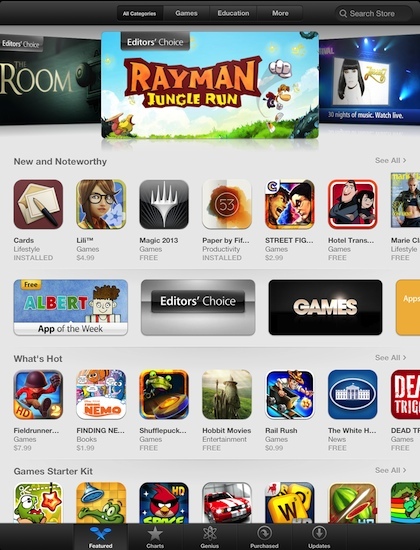 How do you like the iOS6 iTunes app on the iPad? So many features in iOS6 get all the attention. Siri (launch apps with your voice) coming to the iPad (newer model only), new Apple based maps, and integrated Facebook. 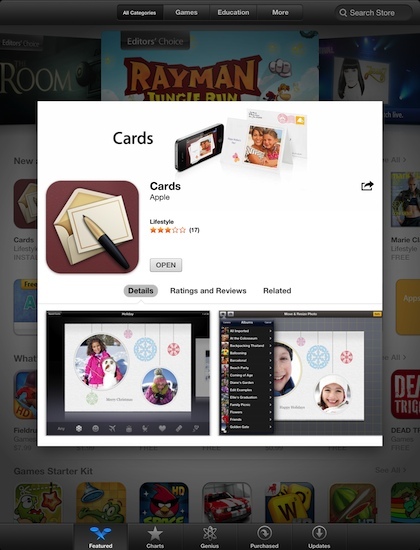 We sometimes miss the fact that an area we use every day got a full re-write too… the iTunes Store App. While becoming similar to the desktop iTunes Store inside of iTunes, the new interface is more iPad like with less changing of screens, more app visuals you swipe side to side. Tap an app icon to have a pop up appear that scrolls up/down for more info. Including descriptions and version details. Tabs are used for access to reviews/comments and ‘other related’ apps. Gone is the action that used to take you to another full size page description where you had to keep ‘tapping back’ to try and return to the overview. Tap outside of the pop up to make it clear from the screen. Notice here that the Apple Cards app is now universal so now it’s layout is nicely laid out for iPad usage rather than running the iPhone version in 2X. As seen throughout iOS6, gone are many of the text lists, replaced with icons for actions like the sharing of an app with friends via email, text and popular social networks. The addition of Facebook means Twitter isn’t the only social connection built-in now. When it comes time for updates, there is more information on the overview screen now. 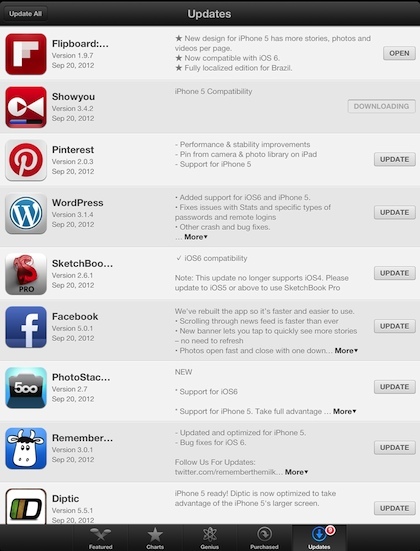 Here you can see a list of apps to be updated. Each has basic information on what is included in the update with ‘more…’ to expand those with more text than will fit in the small area. Tapping the icon has the popup view of the app appear like shown above. 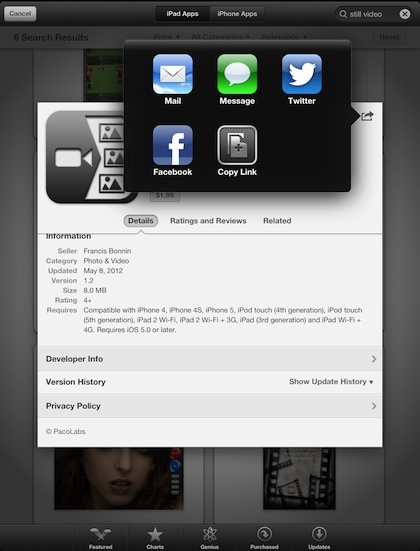 Along the right of the page is the option to update a single app (shown in the lower group of examples below). Working your way up the page, Showyou here is in progress of being updated, where the button changes to ‘Downloading’ and the icon has a progress bar. At the top is Flipboard that has it’s download complete, the button will now ‘open’ the app so there is no need to go to the launcher and search for it. The previous iOS(s) would take you to the area of one of the apps being updated in the launcher if you chose to Update All. After an app has been updated, if you leave the ‘Updates’ area and return, it no longer shows in the list.